Tote measures 16" wide x 12" tall. Cotton. Take a break and paint a tote bag with local artist Donna Ebert on weekends during the Biggest Week at Ottawa National Wildlife Refuge. Classes held from 2 - 5pm on the days listed below. Click the day to register. Painting and drawing from the age of 8, I never tire of learning techniques. Living in my country home (built in 1865) I am inspired by the nature that surrounds me 24/7. Flowers, landscapes and animals have become my favorite subjects. Through the years, I sought artists from coast to coast as well as some of Toledo’s finest instructors and in all types of mediums to improve my skills; decorative, oil, abstract and china painting, botanical illustration, watercolor, stained glass and interior design just to name a few. 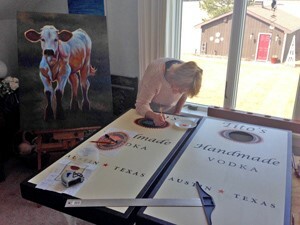 In all, I use a large range of styles, mediums and materials to create works of art. I do not limit my painting to canvas. Why limit yourself when there are paints made for use on everything? I’ve created a large volume of custom designed artwork, shown painting demonstrations, entered art shows and conducted numerous classes and workshops. Along the way, I even won a few awards! In 2014 I started teaching classes in Northwest Ohio full time. I find bliss in painting but also in inspiring others to create their own masterpieces with confidence. There are never mistakes in painting. Be bold!